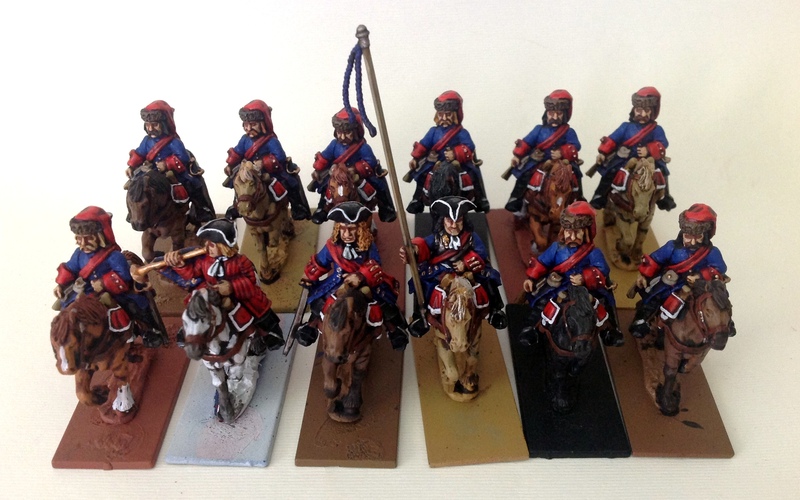 Another WSS commission trundled off the workbench last week, in the form of a Dutch cavalry regiment. While I wouldn’t collect WSS myself in 28mm, the models are certainly a change of pace from Napoleonics – no white crossbelts, well-documented uniforms and some snappy lace to spice things up (which is what lace tends to do on a woman). 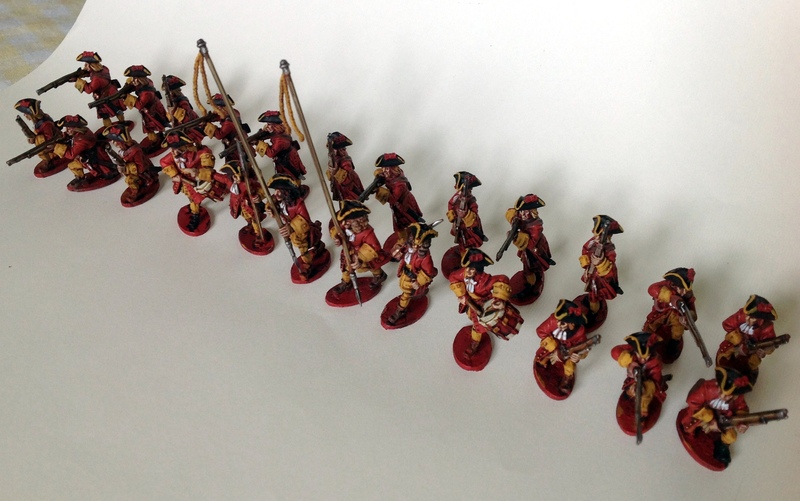 In return for a batch of 6mm WSS I’ve painted up this unit here. Alex gave me a uniform description and the models, and off I went! As you can see I used several primers on the horses – Alex wanted them all brown but I couldn’t resist going with different hues. 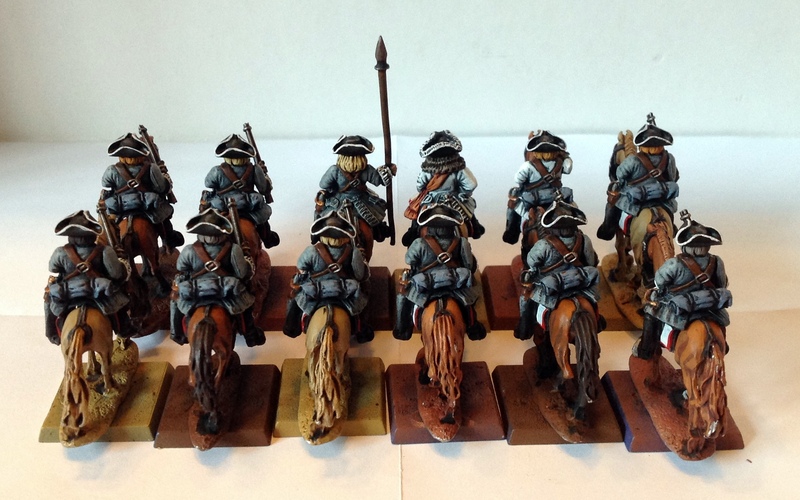 The riders were undercoated black then drybrushed with several greys. The bases and flags will be added by the commissionaire. I have to say I’m not impressed with these sculpts. Paul Hicks is probably in my top five of the best sculptors alive, but these are below par. The horses’ heads are too big, for one, and the riders are very squat looking, almost comically so. To make matters worse, the casts themselves were flawed: one rider is actually missing a right foot! Still, that’s them done. 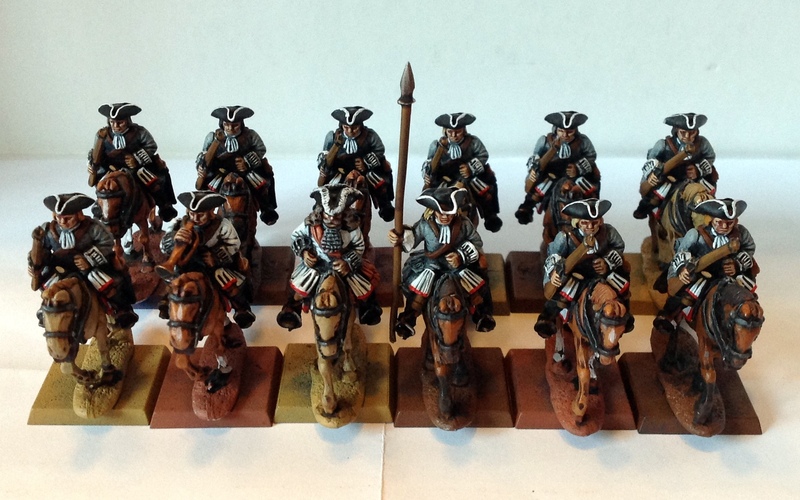 Just the Prussian commission now… But first, some reinforcements for my Dacians! 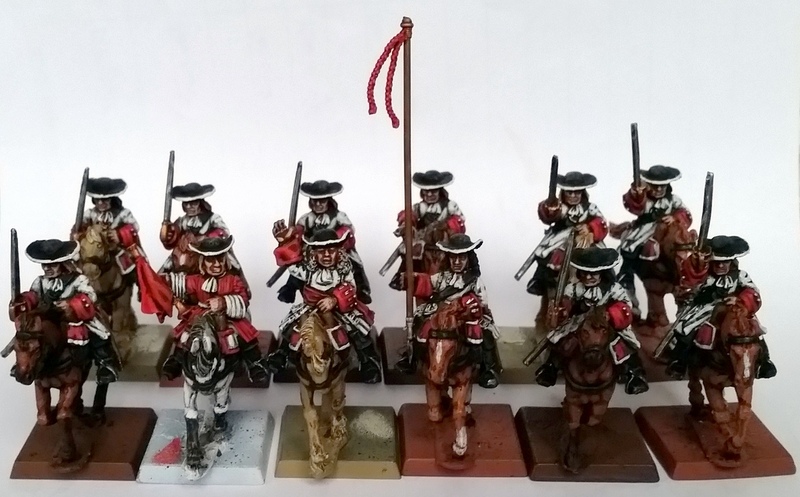 Catalan WSS units… in 6mm! Yes, as you’ve gathered from the title, these are 6mm models. I thought I’d mix things up a bit and not continue painting 28mm models, so I thought these would provide enough variety. They’re also a great way to get some armies where massed units look especially nice, such as WSS (the bicornes do a lot) and the French-Prussian war of 1870 which I’d like to collect some day. The beginnings of this WSS force were kindly supplied by my friend Alex, as he himself has a massive army for the period already and still has some surplus items around. The bases are not completely done yet – I’d like to add some tufts, but of what size? As for painting, I basecoated both these regiments with mournfang brown (the new brown spray from GW). For the infantry I drybrushed various yellows and for the cavalry just white, after which I added just a couple of block painted colours to the small details of these already small models. A special mention goes to the tricornes which I edged white – I think this is the one item people will focus on immediately, and so it pays dividends to get the hats right! On the whole I really enjoyed painting these, and am certainly going to take on some of Alex’ surplus 6mm lead for my own purposes. I’m aiming at getting two or three infantry brigades, a dragoon brigade and assorted commanders and artillery. The question, though, is when. At any rate, thanks for checking this nigh-disused blog once more, and I promise I won’t take another month-and-a-half to update it again! I’ve a fifth French battalion about three-quarters along the way, and they should be ready by next weekend. Adieu! Sometimes you just have to clench your teeth and paint on despite a healthy dislike of the model(s) on your desk – I’m sure all of you miniature painters reading this will be able to relate. For me, the models below were quite a chore to get done. New problems kept cropping up during painting, which made me throw down my brushes and wander off more than once. Still, they’re done and ready to be shown. Models by Foundry – just one sculpt for the troopers makes for tedious painting. As you can witness from the (temporary) bases, I used my new Army Painter undercoat sprays on the horses – fur brown, desert yellow and leather brown – and white and black too, obviously. Not having to basecoat them by hand saves a bit of time – I just slapped on an agrax earthshade wash and then highlighted them with deathclaw brown, zandri dust and gorthor brown respectively. Same for the riders: a guilliman blue undercoat sped them up as well. I took the time to add some woodgrain to their carbines. From then on, it was supposed to be straightforward, but the models somehow didn’t react favourably to my brush strokes. It’s hard to explain, but I kept on making mistakes, accidentally painting over previous work or forgetting to paint certain bits. Still, I’m glad they turned out well. They’ll look better once the owner rebases them on 25x50mm format bases – these are just temporary – and adds the correct flag. 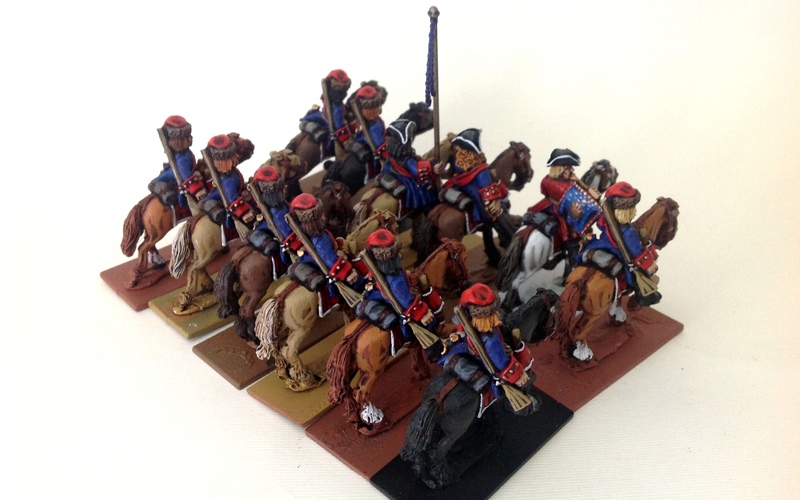 With this unit finished, the War of the Spanish Succession output will be placed on hold for the time being – I’ve too much of my own lead-and-plastic pile that requires my attention, plus some Gripping Beast crusaders for another friend. But keep your eyes peeled, because this evening I’ll put another blog post up! I’m having a very productive month of April, so I thought I’d share some of my output with you again. 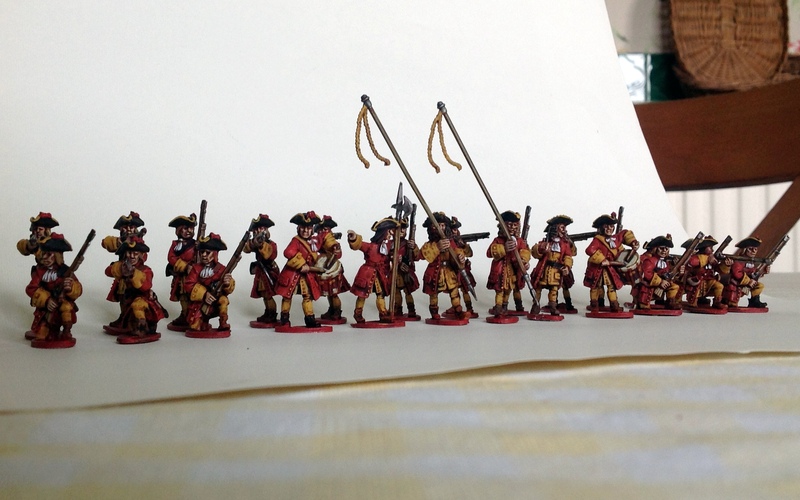 The regiment below is yet another WSS commission for my wargaming chum Alex, this time Berwick. The pictures are extremely shoddy as I was running out of time and I had to use the iPad for it, but they’ll give you at least an idea of it. Some lovely models by Ebor, sculpted by Paul Hicks. 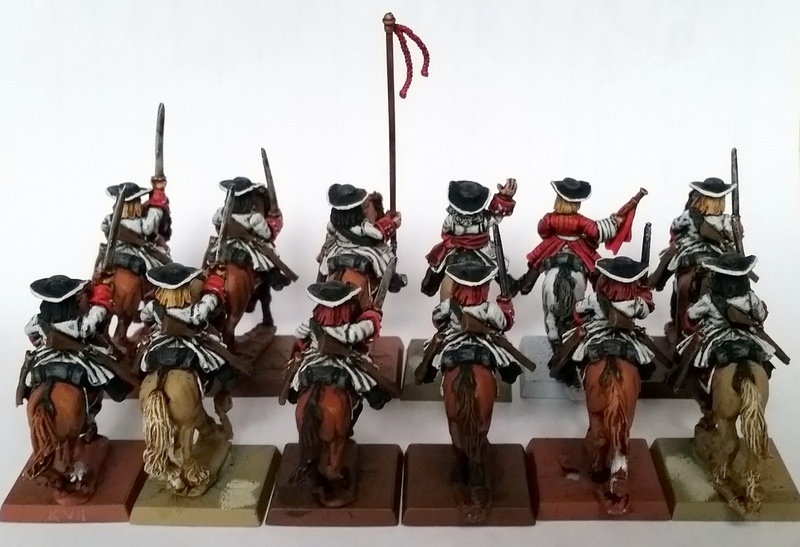 These models are from Ebor, the same as the Swiss ones I painted up back in January, although these are predominantly firing poses as opposed to the marching ones from back then. It’s a bit of a shame that the command group is the same; the unit would benefit from its command models standing still instead of marching. Oh well, as long as the owner’s happy with them! The models will be based and provided with flags by the owner. I painted this entire unit in just two days, which is quite rapid by my standards. Basecoating them red helped immensely, as well as washes. This time I block painted most of the colours over the red before applying a dip-style agrax earthshade wash to the entire model, and I then reapplied some of the basecoats as a highlight tone. I painted them all in a single batch, which I usually don’t like that much – twelve-strong batches are often more than enough for me. Still, I persevered and it paid off handsomely. They’re not the best paintjobs I’ve ever done but I think with proper basing they’ll certainly look the part! That’s about it for today, though. I have one further unit I’ll be blogging on this weekend, and then it’s off to more commission painting – the new Gripping Beast crusaders!